We have not got direct information on the Broad Ripple Potato Chip Company - as yet it does not have a website and is a rather small operation. It does however have a Facebook page and we also found a great article about the start-up and have included some extracts below, as well as a direct link to the original article itself. 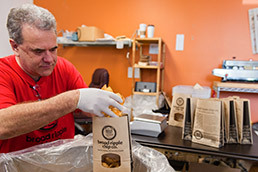 Mark McSweeney launched Broad Ripple Potato Chip Co. last year out of his existing business, a franchise of Great Harvest Bread Co. near 62nd Street and Binford Boulevard. His goal is to capitalize on the fresh-ingredient, buy-local movement - offering a snack food worthy of pairing with a local craft brew. The signature chips are dusted with salt, garlic, sugar and spices the company does not reveal, and they come in a brown paper sack that resembles a lunch bag. A year after setting up in a handful of Indianapolis specialty shops, the chip maker will soon start supplying 17 Kroger stores in central Indiana. The deal with the major grocery chain adds to the four Marsh Supermarkets McSweeney already supplies, plus Pogue’s Run Grocer, Safeway, Green BEAN Delivery and several other local businesses. Broad Ripple Potato Chip finished 2013 with a meager $4,000 in revenue as it got off the ground. But with large contracts lining up, McSweeney expects sales to top $100,000 by the end of 2014. The chips retail for about $3 for a 4-ounce bag, which pushes the prices well over big names such as Frito-Lay, which charge the same price for two or three times as many Chips. Broad Ripple Potato Chip Co.